The South Florida Water Management District (SFWMD) has a mission to manage and protect the region’s water source. One of its key initiatives is the restoration of America’s Everglades, which represents the largest environmental restoration project in the nation’s history. Everglades National Park in southern Florida is home to the Cape Sable seaside sparrow, which achieved its endangered species status in 1967. The sparrows inhabit brushless, subtropical marshes (prairies), which remain dry most of the year. However, because the sparrows build their nests approximately 15 cm (6 in.) off the ground, their nests are vulnerable to flooding. Even though the sparrows depend on their marsh environment to be sustained for their breeding and nesting, the sparrows’ nesting activity will decrease abruptly if their marsh becomes flooded. Because of the risk of flooding, water-level management in the sparrows’ habitat is critical to their survival. Not only do the Cape Sable seaside sparrows have a short life span, but they are inclined to remain in the same general location and not relocate. If the sparrows’ breeding level is low for three or more years, a dramatic decline in their numbers occurs. The SFWMD maintains over 1,000 physical and environmental monitoring stations to satisfy the mandates and activities for flood control, regulation, research, and planning. To help protect the habitat of the Cape Sable seaside sparrow, the SFWMD and the U.S. Fish and Wildlife Service (USFWS) contracted with Hydrogage, Inc. Hydrogage has worked with the SFWMD to install hundreds of monitoring stations over the past 15 to 20 years. 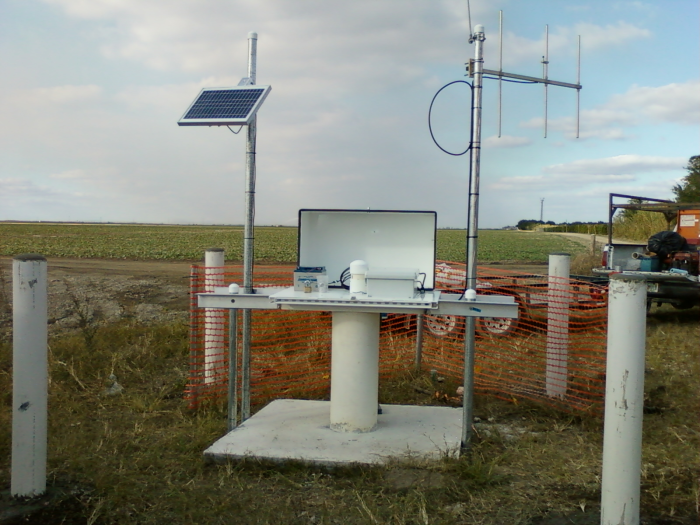 For this specific project, Hydrogage installed stage-monitoring equipment at two hydrologic monitoring stations to measure groundwater changes in relation to adaptive water-management practices. Stage-monitoring equipment was also installed at three new surface-water sites in the sparrows’ breeding area. For the SFWMD to monitor and control their water management practices in the sparrows’ habitat area, shaft encoders were used to measure the surface-water level, and pressure transducers were used to measure the groundwater level. Hydrogage programmed and installed Campbell Scientific CR1000 dataloggers to collect surface-water and groundwater data from the five stations and transmit the data to the SFWMD’s control room via an RF500M radio modem. With the data retrieved using Campbell’s LoggerNet software, the SFWMD maintains healthy seasonal water levels for the sparrows’ breeding and nesting periods. These monitoring efforts continue to help prevent the extinction of this endangered species.